Just a quick post tonight because I today has been absolutely insane. It was my busiest day for the bakery so far: 8 baguettes, 6 loaves of whole wheat bread, two trays of lemon currant rolls, and 2 loaves of rye bread. To make things even busier, I had a baby shower to attend for a colleague, and Son #1 had a birthday party to go to. And, since the birthday party was at the bowling alley, and since the bowling alley staff doesn't even know what vegan means, I had to make a parallel meal for him to take. 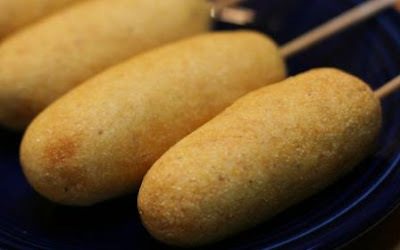 He requested the corn doggies from Happy Herbivore's new e-cookbook (you should buy it). I made them on a bamboo skewer, included some ketchup and mustard for dipping, and he was off. It is great that he now doesn't care that he has to take a different meal to parties, and great dishes like this make it easy for him to be the odd one out. Thanks, Happy Herbivore!